My Xiaomi Mi Band arrived yesterday. As a quick recap, the Mi Band is Xiaomi’s first foray into the fitness band wearables and will compete directly with devices such as Fitbit Flex and Jawbone. The Mi Band is not just cheap, it offers a full array of fitness tracking functionas comparable to the other market big boys and even succeed in innovating a little more. The Mi Band is described as a fitness tracking wrist band that monitors your fitness and tracks your sleep. It features, IP67 waterproof certification, power-efficient Bluetooth 4.0 LE and can be powered for 30 days on one charge. Other functions include an alarm clock, phone call alert, and automatic unlock Xiaomi phones. 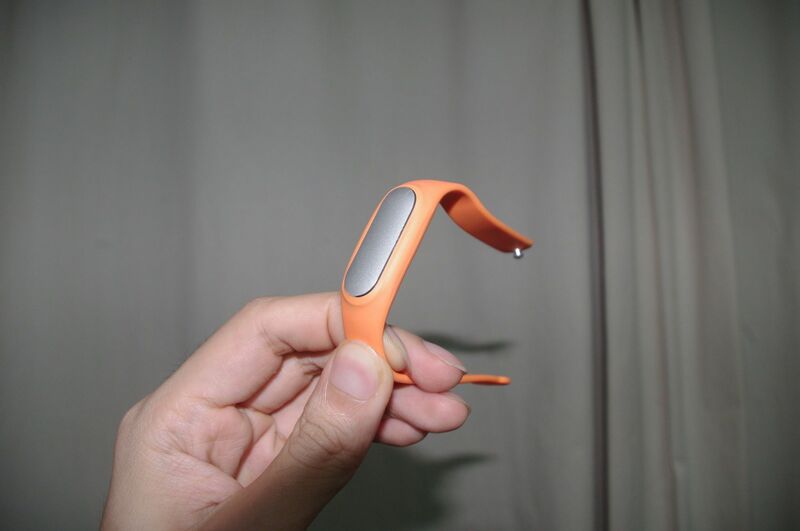 The main tracker itself is made of aluminium and the the wristband is a silicone type material. It is light with a total weight of 13g. The biggest advantage of the Mi Band – PRICE. I paid SG$19.80 for it and an additional $4.50 for shipping from sellers on Qoo10 Singapore. You can pick it up if you are nearby in town, at either Liang Court or infamous Sim Lim Square, depending on the seller. I bought it from Ziming Global on Qoo10 and here’s the link to the product. It actually sells for around US$13 in China. In comparison, a Fitbit Flex retails for S$129, and the Jawbone UP24, S$189. At a fraction of the price, there’s not much else that can go wrong now right, especially if it can meet what’s set out in the product descriptions. Update: 10 Dec 2014: Officially, the Xiaomi Mi Band would be retailing from 16 December onwards from Mi Singapore online; at $19.99. First up, there are potential concerns on whether it is genuine. It came sealed in the cardboard Mi Band packaging and the tracker itself looks to be of good quality. The charging USB cradle is included. It pairs easily with the Mi Band app downloaded from Xiaomi, and was able to update the device firmware with the app.My current firmware version is 1.0.3.9. Overall, I think it is genuine, which makes it a great buy. My review for the purchase stated that I enjoyed the product but encountered slow delivery time which was due to the seller not having sufficient stock on hand. First impressions: the Mi Band is a lightweight, and the band adjusts easily and the clasp secures well over my wrist. It does in a variety of neon colours but apparently Xiaomi only sells the black one currently and the other color bands on sale are all third party. It is just a silicone strap anyway. 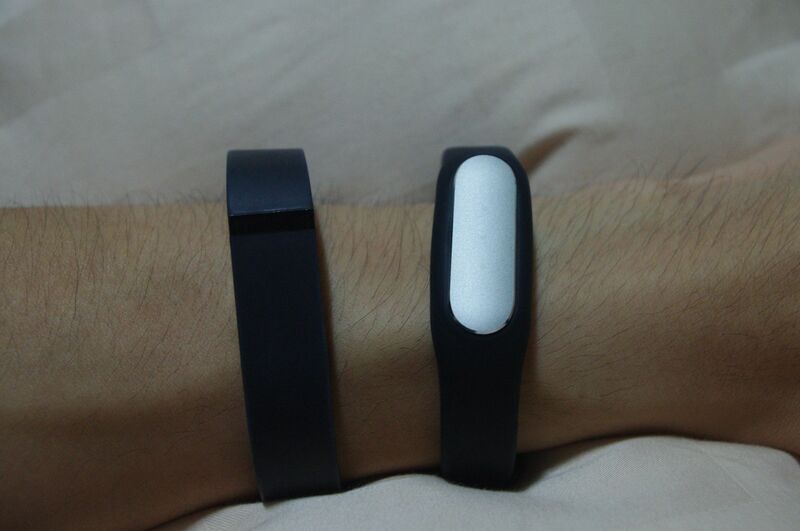 The tracker itself is aluminium and it does stand out as compared to the black band. I would have prefer something more muted but this aluminium tone would go better with other colours. The band is also water resistant, and I wore it for the entire day, including to the shower and it’s still working. After testing the MiBand for a night, I like it much more than Fitbit Flex. Basic features are the same, it tracks the number of steps a day, tells you how far are you away from your goal, etc. I like that it could also track other sports activities, although they might be more of a gimmick now, like it detects when you are running, or can also measure how many sit ups you do, or skipping ropes. All activity tracking were relatively accurate, like the number of sit ups / skips. The sleep tracking was also great. The Mi Band does this automatically as compared to Fitbit Flex which you need to input the time you are asleep. It is able to track the total time you are in bed and the periods of deep sleep and light sleep. It detected I was in bed at 22:34, light sleep for around 15 minutes before entering a period of deep sleep at 22:50. I like the fact that it is all automated. Lastly, the godly battery life of 30 days. How does Mi Band Measure Deep Sleep? Xiaomi’s Mi Band uses it own algorithm to track your sleeping patterns. The Mi Band’s main stages of sleep tracking is from the time you get into bed, light sleep, sleep, and deep (REM) sleep till you wake up. The Mi Band uses 6 components to measure sleep behaviour, and all these 6 components are required to be present for the Mi Band to track sleep behaviour. Xiaomi did not share what these 6 components are though. The Mi Band is able to accomodate slight movement during sleep. Deep sleep or REM is primarily when movement is significantly less. More deep sleep definitely helps, so the Xiaomi Mi Band can help you track your lifestyle patterns to see if it improves your quality or percentage of deep sleep. The Xiaomi does track sleep in the day, but it needs to be significantly long, e.g. more than 30 minutes. Why does the Mi Band track steps during sleep? Well, as you move your hand at night, this behaviour would translate to steps. Perhaps this could be ignored in subsequent application updates. 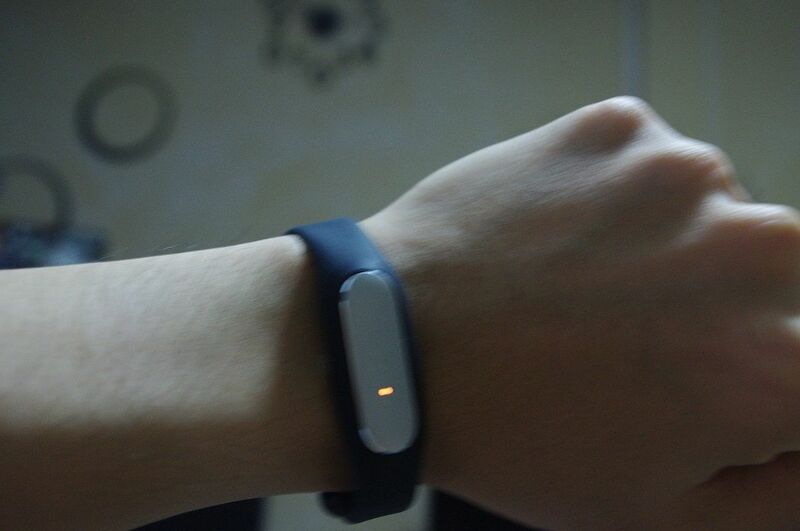 The LED lights on the Mi Band light up to indicate your fitness activity. Turning it on is not so simple though. It sounds simple, raise your hand up to your eye level as if you are reading the time and the motion should trigger the LED lights, one bar for 33%, two bar for 67% and three bar for target achieved! It was more misses for me as perhaps 1 out of 5 tries successfully turned on the LED lights. Its easier to just turn on the app. It could be useful if you are without your phone though. The Mi Band is able to track without a phone and synchronises when it is back in vicinity, therefore I can go for a run without bringing my phone along. Software can be further improved as well. The app design is a little too clean and not very clear on what you can do / click. Swipe left / right to switch between steps and sleep tracking, tap on the overall summary for more details which covers distance, steps, daily burn and can segregate between walking and running activity. It is less intuitive when you want to switch back to previous day activities which would include navigating via the charts. It is only compatible with Android for now, and you would need Bluetooth 4.0 or Android 4.3 on your phone. It also currently doesn’t sync with Google Fit which I am hoping that would come soon. Social sharing options are WeChat, Line, Facebook, and QQ. Overall, the device is quite accurate for a accelerometer type device as compared to a gps tracker. I took it for a jog this morning and Runkeeper measured 2km covered in around 11:35 min while the Mi Band detected a distance of 1.64km with a run time of 10min. Or perhaps it was smart enough to detect that I slowed down towards the end? It is good enough if you just need a quick overview of your activity. The Mi Band uses the latest Bluetooth LE technology, and the device itself just sips away on battery. It only has a 41mAH battery yet is slated to last up to three weeks. I used it for a day, and it dropped from 56%-54%. There is also no real impact on my phone’s battery with the Xiaomi Mi Band connected. I am using an LG G Pro 2 with Android version 4.4.2. The Mi Band offers comparable features to other fitness trackers already in the market. It is however not a smart watch, which would replicate some of the features. It may also lose out on some premium features such as heart rate sensors or an activity monitor screen, but it already offers much for a low price. The price of US$13 or SG$25 (from a third party reseller) means that the Mi Band is a fantastic buy for gadget lovers / geeks. With Christmas just around the corner, I think this would make for a nice gift especially since it falls within gift exchange price categories. Fitness trackers can do much to motivate people to start exercising too. Just knowing that you are 1K away from your daily target could see you start going for evening walks, just ask my wife. 16 Nov 2014: My Mi Band just ran out of battery on Saturday morning. Last I checked was on Friday morning and it was reporting battery capacity of 30%. I didn’t even recall having any low battery notification on my Mi Band. Strange. In fact, I wore the Mi Band for the entire day and only knew it was out of battery at night when I tried to sync it. 27 Nov 2014: The latest app update has introduced a vibration feature when you receive a notification. It will work for emails, whatsapp, SMS and the Mi Band will pulse to notify you of incoming alerts. See my other post (linked in comments) for details. The Mi Band officially comes in Black only. That’s a little boring. If you are looking for more color options to spruce your Mi Band, you can get extra replacement Xiaomi Mi Band straps from eBay here. I ordered an orange one and its still in delivery status. eBay Paypal protection is pretty solid though. I am still on the lookout for the leather straps. I thought those were pretty nice looking too. It comes with a Chinese manual. But use is pretty straight forward. App is in english (see shots above). You can download from play store as well, if I am not wrong, it will detect base on your default locale. Or get it from Xiaomi http://app.mi.com/detail/68548 for the latest version. There’s also a tweaked english app with added functionalities such as calorie intake comparison and improved sharing options.